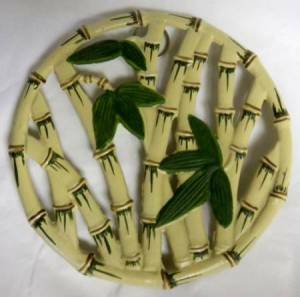 Tea trivet made to look like bamboo trees decorated with leaves and green trim. Give your kitchen a natural look with this cast iron trivet. Hang it on the wall for decoration or use it to protect counters and tables from a hot pan. Wipe clean with a damp cloth.